TOMEI developed an affordable, yet effective clutch-type limited slip differential (LSD) for the Honda S2000 (AP1 / AP2). This 2.0 Way locks aggressively and is an excellent way of providing additional grip to your car! TOMEI's setup utilizes high initial torque presettings with large discs, providing strong, yet efficient power transfer. 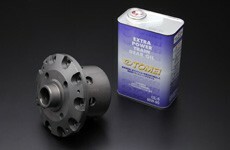 TOMEI has found that the larger discs distribute the torque more evenly and instantaneously. This is excellent for hard drag race launches and excellent vehicle control during drifting.